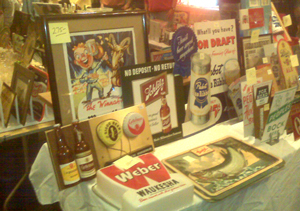 A popular Waukesha, Wisconsin brewery collectible, this Weber Beer sign is diplayed for sale with some Gettleman, Pabst and Schlitz signs. You'll also find some old vintage soda collectibles from Coke, Pepsi, 7up, RC Cola, Graf's and various root beer producers like Dad's and Hire's. From the Land of Sky Blue Waters! You can almost hear the drums beating when you see this rare Hamm’s prototype beer porcelain bottle. There were only 6 of these made as samples before the brewery decided use a different logo in production. Some really nice Hamm’s bear lighters from the 1960’S. The center one plays the Hamm’s jingle when used.